Meg gift wraps for the holidays with Jewelry is presented in little jewelry bags + tissue and a Meg bag all year round. L train at First Avenue and 14th Street: walk 5 blocks (South) down First Avenue; walk 3/4 block West (right) on East 9th Street. 6 train at 8th Street and Astor Place: walk 3 blocks (East) on 8th Street to 2nd Avenue; walk 1 block North (Left) up 2nd Avenue; walk 1/4 block East (right) on East 9th Street. R & W trains at 8th Street and Broadway: walk 4 blocks (East) on 8th Street to 2nd Avenue; walk 1 block North (Left) up 2nd Avenue; walk 1/4 block East (right) on East 9th Street. For the past sixteen years, Canadian born designer, Meg Kinney, has been designing affordable, ready to wear clothing for women. Meg is inspired by designs from the thirties, forties and fifties. Her mission is to provide a quality line of women’s wear that is comfortable yet fashionable and at an affordable price. Meg doesn’t make couture clothing, instead she makes accessible, fashion forward and fun clothing. 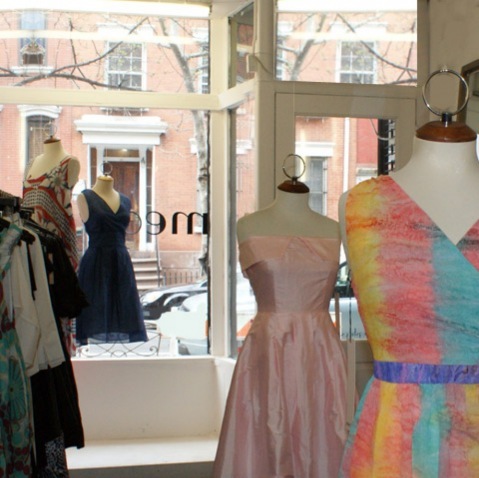 In 1994 Meg opened her first store on ever so trendy East 9th street where the store fronts are alive with small boutiques and the sidewalks bustle with movement. She has since opened a store in Dublin, Ireland and Toronto, Canada. In a time where women are hungry for clothing designed around a real women’s proportions with curves and shapes, Meg’s clothing sizes range from 2 (extra small) to 14 (large). Her store on East 9th is complete with private dressing pods in the rear of the store. Customers can expect special attention from a staff with an understanding of how clothing should fit. In addition, they are prepared to make small alterations in areas such as length for a small fee. You can expect a boutique with contemporary clothing with classic lines that transcends the seasons. Fabrics are sourced from Canada and the U.S., when possible. Meg manufactures her clothing in Canada and produces over forty-five styles each season. This year she will be releasing a new line of non-traditional bride dresses for women headed to city hall or some far away beach resort. While you are there, indulge in Meg’s signature aromatherapy room oil in fragrant Lemongrass and lavender scent, created exclusively for her boutiques.